Globally, the number of people who have experienced a stroke or cerebrovascular accident has increased significantly. According to the data revealed by the World Health Organization (WHO), this accident is considered as the second leading cause of deaths. Adding to it, supportive reimbursement policies and the growing application of ultrasound in vascular treatment have provided a significant push in this market. Changing preference for minimally invasive surgeries and the acquisition of small specialized hospitals has also grown the demand in the thrombectomy devices market. The global thrombectomy devices market is anticipated to rise at a steady 6.1% CAGR throughout the forecast tenure from 2017 to 2022. In 2017, the valuation of the thrombectomy devices market was US$1.47 bn and is expected to reach US$ 1.94 bn by the end of 2022. The global thrombectomy devices market is categorized on the basis of product, application, and end use. The end-user segment is classified into ambulatory surgical centers, clinics, hospitals, and others. Among these, the demand for thrombectomy devices is high in hospitals. On the other hand, the demand for thrombectomy devices is growing constantly in the ambulatory surgical centers as they provide help on an immediate basis. Moreover, increasing need for miniaturized therapeutic devices and growing technological advancements for minimally invasive surgical techniques are also responsible for the growth of this segment. Based on product type, the market is segmented into mechanical, aspiration, ultrasonic, and hydrodynamic. The aspiration thrombectomy devices segment held 28.6% market share in 2017. This segment is likely to be the most profitable segment throughout the forecast tenure by rising at 4.4% CAGR between 2017 and 2022. In terms of revenue, this segment is likely to touch US$521.2 mn by the end of the tenure. Thrombectomy devices are used to treat neurovascular, peripheral, and cardiovascular disorders. However, its application is largely seen in treating cardiovascular disorders. This is due to rising preference for minimally invasive surgeries and the growing number of geriatric population where the percentage of cardiac surgeries is high. On geographical front, the global thrombectomy devices market is segmented into South America, North America, Europe, Japan, Asia Pacific excluding Japan, and the Middle East and Africa. Among these regions, North America is expected to lead the market due to increasing adoption of advanced technology used for making thrombectomy devices. Rising demand for thrombectomy devices in North America is likely to rise at 6.4% of CAGR and reach a valuation of US$0.776 bn by the end of 2022. Additionally, developing healthcare infrastructure, rising number of clinical trials, and supportive reimbursement policies in this region has increased the demand in this market. On the other hand, the demand for thrombectomy devices is rising in Asia Pacific excluding Japan. As the use of thrombectomy devices is high in healthcare and growing healthcare expenditure is expected to boost demand in the thrombectomy devices market. Moreover, countries like Japan, China, and India have increased their healthcare expenditure, strengthening of distribution networks via collaborations, and growing awareness among surgeons about the benefits of using these devices is expected to benefit the market’s growth. The global thrombectomy devices market could be fragmented in nature due to the presence of significant number of large and small players. Some of the key players of the market are Boston Scientific Corporation, Stryker Corporation, Argon Medical Devices Inc., Medtronic PLC, and Penumbra, Inc. leading players in the market are acquiring smaller players and focusing on innovating their products to get a firm hold in the market at the global level. The in-depth research and improvements have been done and as of late, they have prompted propelled thrombectomy devices, which are utilized for the expulsion of clumps that are obstructing the blood flow. The factors, for example, great therapeutic repayment strategies in the created nations, developing inclination of negligibly intrusive methodology, growing use of acquiring of small healthcare facilities by tier- 1 clinics and ultrasound in vascular treatment. The report has been created by encounter market look into experts and tries to fill in as a tenable business device for focused groups of onlookers, for example, human services benefit gives including healing facilities and surgical focuses, government administrative specialists, non-government associations, clinical research associations, examine labs and scholastic organizations, and innovative work organizations. The development of the worldwide thrombectomy devices market is fuelled by various components, among which the rising frequency of cerebrovascular issue is a noticeable one. The World Health Organization has recognized cerebrovascular mishap or stroke to be the world's second driving reason for death. Aside from this, mechanical advances, expanding medicinal services spending in developing economies, great restorative repayment situations, and rising interest for insignificantly intrusive methods for thrombectomy are some other unmistakable components driving this present market's development. Obtaining of specific centers for thrombectomy by level 1 healing facilities is another development drift going to the fore in the worldwide thrombectomy devices market. This is boosting persistent administer to the particular preparing got by staff, attendants, and doctors at level 1multi-strength doctor's facilities. Further, rising predominance of cardiovascular and cerebrovascular illnesses and innovative advances prompting the coming of laser and UV radiation are some other key components expanding the interest for thrombectomy devices. Among all the regions and nations, thrombectomy devices have the greatest request in North America, particularly in the created nation of the U.S., owing components, for example, to developing selection of mechanically propelled thrombectomy items, expanded number of hospital trials, powerful medicinal services foundation, and repayment approaches. The demand for the thrombectomy devices market in North America because of its increase at a steady CAGR of 6.4% amid the estimated time of 2017 to 2022. Moreover, the market is likely to reach the worth around US$ 776.3 mn by 2022. Then again, the interest for thrombectomy devices in the locale Asia Pacific is to grow at a strong CAGR of 6.3% amid the said figure period. The Asia Pacific thrombectomy devices market is supported by expanding human services use in the rising economies, for example, China, India, and Japan, increment in confined assembling, reinforcing of appropriation systems by means of joint efforts, rising mindfulness among specialists in regards to the advantages presented by these devices. The worldwide thrombectomy devices market is profoundly divided because of the nearness of extensive, medium, and little measured organizations. Drivers, for example, headways innovation and item upgradation will drive the focused condition among the merchants in the market. Merchants progressively contend based on variables, for example, forceful evaluating, item affectability, high ventures, and innovation upgradation. Also, the vast organizations represent the most extreme market share as they participate in the making and distribution of thrombectomy frameworks and embellishments. 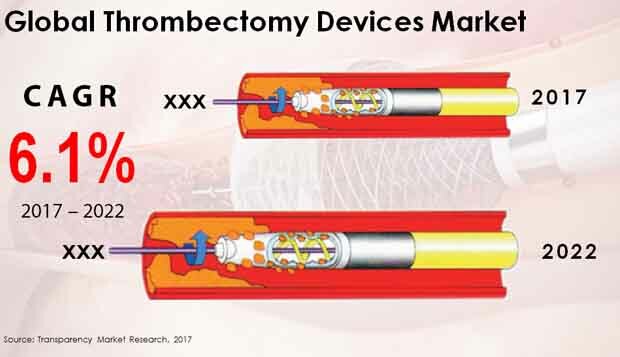 Boston Scientific Corporation, Penumbra, Inc., Medtronic PLC, Terumo Corporation, Stryker Corporation, Argon Medical Devices Inc., and Teleflex Inc. are among the major players in the worldwide thrombectomy market.